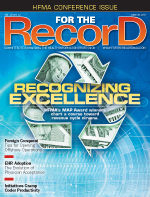 HFMA’s MAP Award winners chart a course toward revenue cycle nirvana. Faced with declining reimbursement levels, new payment models, and multiple unfunded mandates, hospital finance departments are under tremendous pressure to maximize revenue cycle performance. At the same time, they are being asked to scrutinize processes to identify ways to streamline operations to reduce costs and improve efficiencies. Until 2009, most finance departments labored in relative anonymity as other hospital personnel received industry accolades for everything from innovation and quality to performance. That all changed when the Healthcare Financial Management Association (HFMA) introduced the MAP (Measure. Apply. Perform.) Award recognizing excellence in revenue cycle management. The HFMA’s MAP program is an offshoot of the organization’s Patient Friendly Billing project, launched to promote clear, concise, correct, and patient-friendly financial communications. It started when the HFMA identified hospitals that performed exceptionally well on the core competencies necessary for patient-friendly billing protocols to be sustainable and drive real value. At the same time, the organization formed the key performance indicators task force, consisting of chief financial officers (CFOs) and revenue cycle leaders, to create standard metrics, or keys, to measure revenue cycle performance. In all, 19 keys have been published, with six more slated for release at ANI: The Healthcare Finance Conference this month. These keys enable consistent reporting and peer-to-peer comparison of metrics across the revenue cycle. The decision was then made to recognize 14 high-performing hospitals at the 2009 ANI conference, and the MAP Award was born. The HFMA received applications from approximately 150 hospitals for the 2011 award program. According to Lestina, the 12 winners shared four common themes, including a significant focus on top-down collaboration through shared accountability for revenue cycle performance. Also prominent were a focus on cost reductions and a shared understanding that the revenue cycle needed to succeed for the facility to achieve its operational and clinical goals. In fact, to even be considered for the MAP Award, a hospital must have a patient satisfaction rating of at least 75%. Winning hospitals also share a low number of days in accounts receivable (AR), an accelerated billing cycle, and high point-of-service cash collections. This year, the hospitals that rose to the top all shared innovation in their approach to financially clearing patients as quickly as possible, which Lestina suggests is related to addressing changes under healthcare reform. In all cases, hospitals had strategies in place to identify any third-party payment sources, check a patient’s propensity and ability to pay, and get those who qualified covered under charity care or other financial assistance programs. “What they are trying to do is reduce the anxiety and confusion over the process by taking care of the financial component as quickly as possible,” Lestina says. “They are more efficient at identifying patients who have the ability to pay vs. those who don’t. While this is not necessarily unique, these hospitals have brought it to a more efficient level … the whole component of trying to create a better patient financial experience is unique with these organizations in terms of the efficiency they are able to create around that. “The use of technology is also apparent with these high performers. They know they have limited resources, so they focus technology on those areas where it will bring most value,” she adds. Concord Hospital, one of the 2011 MAP winners, utilizes technology to improve its revenue cycle performance. The 295-bed regional medical center is the second busiest acute care hospital in New Hampshire, recording 16,800 admissions and more than 68,000 emergency department visits in 2010. According to Kevin Hunt, Concord’s senior director of revenue management, a combination of people and processes gets credit for the hospital’s high-performing revenue cycle. But what really sets Concord apart is the fact that 93% of payments are received electronically. This has allowed the organization to take several additional steps that have dramatically improved the claims process. For example, the hospital has set up a database to track and analyze all claim status 4 denials. By addressing issues contributing to denials, Concord has been able to “mitigate that volume downward so that our claims became cleaner and cleaner. In 2010, we submitted a little over 900,000 claims and had only 31,000 claim status 4 rejections, resulting in just 0.38 of 1% of provider-liable adjustments. That’s remarkably low,” Hunt says. A log of all claims is reviewed monthly, and steps are taken to resolve any issues. Currently, the facility is monitoring more than 1,200 edits, excluding correct coding initiative and outpatient code editor edits. Concord also uses a common registration for its inpatient and outpatient services as well as across the 18 physician offices that have been brought on as hospital outpatient departments since 2005. This means there is a shared responsibility for maintaining the master patient index’s data integrity, enabling some offices to directly schedule diagnostic services for patients. The common registration system creates a shared medical record that is available across the system, which in turn allows Concord to generate a single bill encompassing all services a patient receives regardless of where in the system those services were rendered. Billing is handled through a single office, and staff are trained to do both professional and technical billing of services. Finally, Concord has made significant gains in managing its charity care program. In 2005, it provided approximately $5 million in charitable services. Last year, the amount totaled more than $32 million. Part of Concord’s strategy for improving charity care processes was to evaluate who was accessing the program and how often. This revealed a patient population that had been using the program, which awards assistance in six-month intervals, for as long as two years. To better care for these patients who were using Concord as an insurer of last resort, the hospital moved them into medical homes where their health could be more closely monitored. This provided an opportunity to reduce the cost of care for the minority of patients who remained on financial assistance for an extended period of time. Concord has also stepped up its evaluation of financially assisted patients’ ability to pay to involve them in the responsible use of medical care. On another front, it is working to get those who qualify enrolled in Medicaid. For Saint Francis Health System, a smooth-running revenue cycle requires the integration of and active collaboration between multiple departments, including HIM, case management, patient accounting, patient access, and managed care. In addition to monthly meetings and weekly interactions, the hospital launched a dashboard in 2009 that allows departments to track their own activities and those of their peers, analyze issues and gaps, and take corrective action before the revenue cycle is impacted. “What we find in a lot of organizations is that all these departments don’t necessarily report up through the same person, so each has different goals and strategies. They don’t have the same strategic plans,” says Eric Schick, vice president of finance for the Tulsa-based three-hospital system with multiple outpatient diagnostic and surgery centers. For example, case management’s goals may be tied to length of stay, case mix, etc, “so resources are pulled that way instead of toward looking at denials and getting information out to payers,” Schick says. Another example is within the HIM department. Accounting’s goal may be to reduce days in AR to fewer than 30. However, achieving that goal is impacted by HIM’s struggle to get physicians to complete the documentation they need to accurately and compliantly code for billing. Or they may be short coders for the record volume and unable to invest in outsourcing some of the work to alleviate backlogs. “All of these things dramatically affect the revenue cycle, so you have to get in front of physicians and explain to them the importance of completing medical records and the timeliness of responding to inquiries,” Schick says. By emphasizing a top-down collaborative approach to resolving these issues, the various departments are able to see how each impacts the revenue cycle. It facilitates a united front and instills a high level of departmental accountability. Central to this integrative approach is the dashboard that allows each department to run performance reports on key indicators and compare the data to those produced by other departments. Schick says it started with patient accounting and quickly expanded as it became clear just how critical each individual department’s performance was to the overall revenue cycle. Each dashboard is designed to measure metrics that are specific to that department. For example, patient accounting monitors billing and collections with a goal of keeping Medicare AR over 60 days to less than 10% and credit balances over 90 days to less than 0.5%. For HIM, metrics measure the quality of coding, medical records, and transcription, while patient access monitors centralized scheduling, verification and authorization, admitting, and monthly cash collection. Managed care’s dashboard measures the speed and accuracy of payments made by each payer and compares them with the contractual requirements. Further, the department is charged with meeting monthly with every managed care payer to go over reimbursement performance. The dashboard “shows everyone that they have skin in the game,” Schick says. Since focusing on a highly collaborative approach to maximizing revenue cycle performance and introducing the dashboards, Saint Francis has seen some impressive changes. Most significant is the drop in AR days to an average of between 22 and 24 compared with a benchmark from Standard & Poor’s (S&P) of between 45 and 50 days. That has earned the health system an AA+ from S&P, one of only four hospitals in the nation to earn that distinction. It has also achieved an Aa2 rating from Moody’s. The cash collections goal was set at training 60 days net revenue, a mark that has been exceeded by 100% for the past year. That, in turn, drives down AR days. Finally, next year, bad debt as a percentage of gross charges is projected to hit its lowest point in 15 years. For 2011, it is at 2.8%. “When you look at that in comparison to a lot other organizations, others have seen a huge increase in bad debt that we have not,” Schick says. Achieving the level of collaboration necessary to realize the significant benefits of an efficient revenue cycle was not without its hurdles. Schick notes that the biggest challenge was simply getting to the point where departments were communicating regularly. However, the outcomes have been worth the struggle. • Baptist Hospital of Miami, Miami, Fla.
• Baylor Medical Center at Irving, Irving, Tex. • CHRISTUS Health - St. Catherine Hospital, Katy, Tex. • Concord Hospital, Concord, N.H.
• Legacy Good Samaritan Medical Center, Portland, Ore.
• Lynchburg General Hospital, Lynchburg, Va.
• Princeton Baptist Medical Center, Birmingham, Ala.
• Saint Francis Hospital, Tulsa, Okla.
• Sharp Grossmont Hospital, La Mesa, Calif.
• Spectrum Health Grand Rapids Hospital, Grand Rapids, Mich.
• Texas Health Presbyterian Hospital Plano, Plano, Tex.